Getting to know the new NCAA men’s national coordinator. 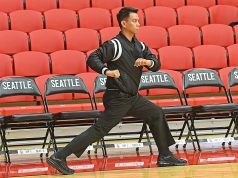 Experience: NCAA national coordinator of men’s basketball officiating; former coordinator of officials for the Mid-American Conference and Summit League; former consultant to the Big Ten Conference; former D-I official for nearly two decades, including two Final Fours. Suffered career-ending injury in 2009-10 season; worked in seven conferences. REFEREE: How would you describe the current state of officiating? 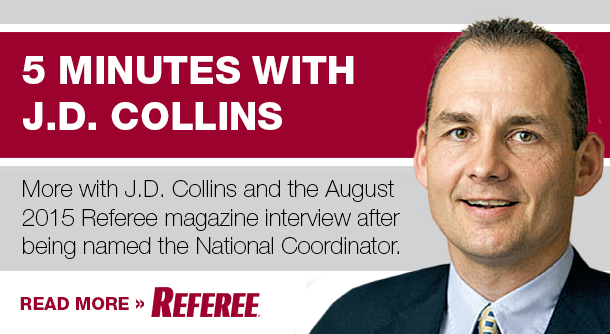 COLLINS: Across the country we have quality officials doing great work, night in and night out. That gets overlooked. Our missed-call ratio or our accuracy of calls, is extremely high. One play in one game can get a lot of attention, but our officials across the country are doing a great job. I’ve stood in the shoes they stand in. I know how difficult it is to do their job, and they deserve to be credited with doing some outstanding work. REFEREE: Block-charge plays continue to be in the headlines. What can be done to increase the accuracy, and does the accuracy change from lead, center and trail when called from those respective spots on the floor? COLLINS: That’s a chicken and the egg question there. First, on any play, you have to be in the right position to make the call. If the play is coming down the paint, going to the rim, and the lead is in the proper position and has a good angle between the players, he should be able to assess whether the defender is legal prior to that crash happening. The reality is that the center official is straightlined with the defender. Can he see left movement of three to four inches? In that play, the center may not have the best look and the lead needs to address it. Positioning is the key, knowing who the primary is. Overall, one of the things that we overlook is when we’ve got crashes and bodies down, we need to seriously consider having calls. Too many times there are crashes, bodies on the floor, we don’t address the play, and then the game itself gets more physical. Is there empirical data that says we’re missing block-charge plays? Because I’ve had access that says we’re doing a pretty good job of getting the block-charge plays right. If there’s empirical data out there that says our accuracy isn’t high enough, then we need to address that. But if we’re getting an acceptable rate, then maybe there are other plays that deserve more attention. 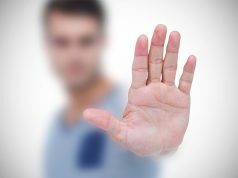 Are we dealing with a perception that block-charge plays are not correct or are we dealing with reality and the empirical data that says we are or are not? In my infancy at this position, I don’t know that answer.